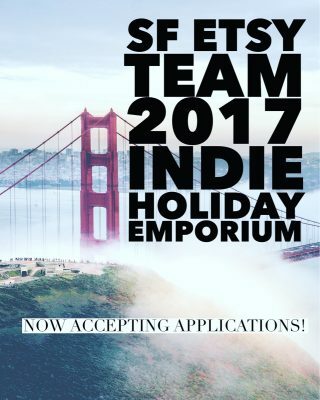 We are very excited to announce our 5th annual SF Etsy Indie Holiday Emporium. It will be held at Pier 35 on the Embarcadero in San Francisco November 25-26, 2017. We are so EXCITED about partnering again with Etsy to provide an awesome space and experience for vendors and shoppers. We’re going to be featuring over 150 Etsy sellers and a free craft experience provided by GoGo Craft. It’s going to be a terrific event! We will have room for approximately 200 vendors and you can share a 10×10′ booth. Smaller 10’x5′ spaces will also be available but CANNOT be shared. If you’re planning to share a large booth, you will be required to submit a single application jointly with your intended booth partner and will go through the jury process as one application. We will be accepting applications for this show until September 30, 2017. This event is ideal for handmade artists, illustrators, and craftspeople that make their own items. We will not be accommodating resellers of manufactured goods or food items. As a requirement to this show, you will need to promote and market this event within your network. We will be providing you with promotional materials. Please let us know if you run out and need additional promotional materials. Submissions are due by 11:59pm September 30, 2017 with notifications of acceptance or non-acceptance sent by email by October 9, 2017. IF you are selected for acceptance into the show, a payment invoice will be included with your acceptance and be payable via credit/debit card. The emporium will be open from Saturday 11am to 5pm and Sunday 11am to 5pm. Detailed instructions for load in will be sent later to all accepted vendors. For questions, please contact us at shows@etsysf.com. This is an INDOOR event – rain or shine.